Self Supported, Trussless Roofing Solutions, 100% Leak proofness, large enclosed volumes, No Bird nuisance, No nuts bolts or overlapping of sheets. 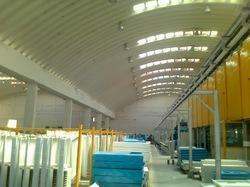 Ideal roofing solution for warehouse,Manufacturing areas, food industries, battery manufacturing areas etc. We are counted among the well established organizations involved in providing an impeccable range of Self Supported Roofs. These systems are fabricated using supreme quality raw material and requisite technologies, so as to meet the international quality standards. Various construction companies highly demand these systems for their high tensile strength and excellent designs. With our excellent expertise in the field of metallurgy, SV considers itself apt to manufacture high-end roofing systems that could support the industrial needs of our nation for years to come. Made from graded composites of metals like aluminum, our Roofing systems are popular for their tenacity and long service life. 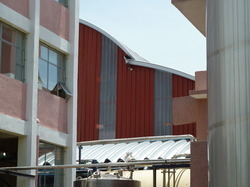 Keeping in mind the variety of a clients needs, SV has developed a full-fledged extensive clear span Green Curved Roofing System that has seen engineering as an advanced ventilation system meant for full installation at the time of application and function. We offer our system at very reasonably industry prices. We are the providers of industry grade Metal Roofs that come in multi grade metallic systems with high-end technological prowess at hand. Additionally, our systems comprise of a good bearing of the industry standards that come in place with parallel industrial standards of the first world. 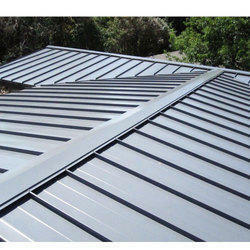 We provide Metal Building System which is 100% leakproof gives galvalume roofing. 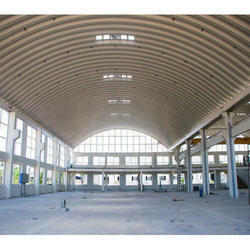 Keeping in mind the variety of a clients needs, SV has developed a full-fledged extensive clear span Curved Roofing System that has seen engineering as an advanced ventilation system meant for full installation at the time of application and function. We offer our system at very reasonably industry prices. 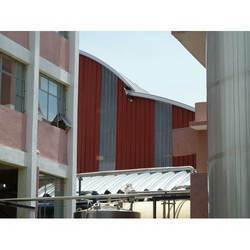 Leakproof Roofing offered can be made available by us in different finish configuration choices and provide suitable leak proof roofing solution support as demanded by the customers. Further, these roofing solutions comprise use of aluminium/galvanized steel sheets with different panel thickness of 0.45 to 0.6mm. Some of its features include available in different color choices; options of different widths and thickness; different surface structure designs like zero spangle, regular spangle, big spangle; galvanized coating support for lasting service usage. The Arched Roof from the house of SV is an example of quality engineering and reasonable pricing that comes through the proper use of construction material utility and infrastructure stability. The arched roof is reliable and stands tough for decades on end. 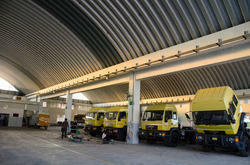 We also provide for customization on our arched roofs. 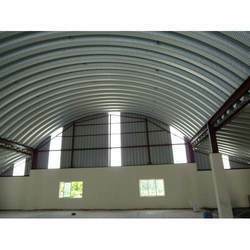 Roof Sheeting offered comprise quality finished metal roof sheeting that can be made available by us in different standard sizes and thicknesses with option of OEM construction as demanded by the customers. Further, these come with advantage of light roofing material which makes it convenient to carry, store and use. Some of its features include allows for simple handling support; suitable for use in all kinds of building structures; provides for superior fire resistance; offering superior hail-resistance among others. 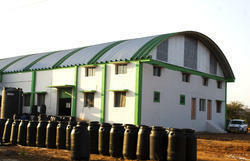 The Curved Roof from the house of Sungreen Ventilation is a mark of industrial quality standards. Our product is quite popular in the small-scale industrial background, and comes with the promise of everlasting compressor and tube technology. We offer customization on our product. The absence of bolts or nuts removes the risk of leakage. Maintenance free, as there are no nuts or bolts to replace. The fastest roofing, easy to install and can be finished within days. Aesthetic shape and can be designed in a variety of creative forms. We have a deep and reasonable insight towards the needs of our clients. 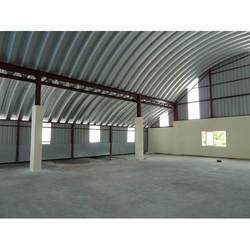 Additionally, we have come out with a comprehensive clear span Warehouse Roofing System that has an extremely well engineered ventilation system developed during the time of construction. Additionally, we have a good knowledge and expertise in the field of metallurgy; that we utilize towards the functioning of the perfect industrial building that comes engineered as a ventilation system that promises longevity. The Self Supporting Roof from the house of Sungreen Ventilation is a mark of industrial quality standards. Our product is quite popular in the small-scale industrial background, and comes with the promise of everlasting compressor and tube technology. We offer customization on our product. 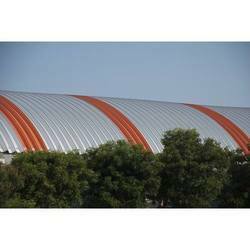 Truss Less Roofing offered comes in light steel structure finish and can be made available as per design standards like AISI, ASTM, BS, DIN, JIS and others. 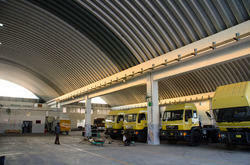 Further, the offered roofing solutions can be offered in lengths as demanded by customers. 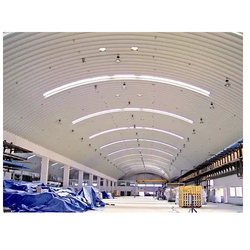 Some of its features include available in choice of single span, double-span, multi-span options; different truss design shape like ladder triangle square curve circle; truss length options of 0.5 to 4m; suitable for use in indoor or outdoor activities; durable, light weight finish; high loading capacity. With our excellent expertise in the field of metallurgy, SV considers itself apt to manufacture high-end roofing systems that could support the industrial needs of our nation for years to come. Made from graded composites of metals like aluminum, our Metal Roofing System is popular for their tenacity and long service life. The Self Supported Roofing from the house of Sungreen Ventilation is a mark of industrial quality standards. Our product is quite popular in the small-scale industrial background, and comes with the promise of everlasting compressor and tube technology. We offer customization on our product. 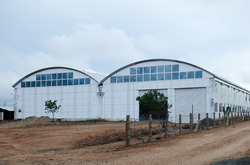 The Pre Engineered Building from the house of Sungreen Ventilation is a mark of industrial quality standards. Our product is quite popular in the small-scale industrial background, and comes with the promise of everlasting compressor and tube technology. We offer customization on our product. We also have in line, an Arched Roof that comes constructed for the purpose of complete client service and promises years of strength and durability. Besides, we know how to make use of our systems by applying focus upon the particular requirements of an arched roof in our industry. We have in our line-up an industry-grade Trussless Roof that comes manufactured with graded material and industry support for the best performance. Additionally, we provide for a good trussless roof under the many specifications that should suit the needs of most of our clientele.